Ceiling Fans – Blowing Your Money? The Interfaith Coalition on Energy (ICE) has always doubted the energy effectiveness of ceiling fans during the heating season. The theory says that warm air rises toward the sanctuary ceiling and that ceiling fans can force down the warm air to mix with cooler air at the pew level. Therefore, the thermostat is satisfied sooner, and less heat is lost through the cooler ceiling area or holes to the attic. ICE thinks that ceiling fans have a very low priority, relative to other energy conservation measures, and they may not save any energy at all. Clock thermostats and changes in lighting are likely to make more economic sense. In fact, the use of ceiling fans during the heating season may increase the consumption of both heating energy and electricity. In 1982, ICE asked the manufacturers of ceiling fans to supply us with metered data showing that the fans actually save energy. No manufacturer has ever supplied us with such data. We published our misgivings about ceiling fans in the ninth issue of this newsletter in June, 1984. One manufacturer and two manufacturer representatives called us. Again we asked them for data to show that the ceiling fans saved energy. None was received. One representative said that he had an actual case study on a hotel lobby. When we called him back to tell him that we never received the information, he said that the data turned out to be inconclusive. During our conversations, some manufacturers of commercial or industrial fans are critical of the smaller, less powerful, but more ornate counterparts that are used mostly in homes. They say that the fans must blow a lot of air to be effective. Apparently there are big differences between types of ceiling fans. When can they be used? Does it make sense to use the fans in a cold sanctuary? No, because in a cold sanctuary there is no heat to be saved. Does it make sense to use the fans in an occupied sanctuary? No, because the noise and motion is distracting to some members of the congregation. But more important, moving air creates a feeling that the room is drafty. The only way to overcome the wind chill is to turn up the thermostat, and that causes the energy consumption to increase. Therefore, the only possible time when the fans could be helpful would be the warm-up period of the sanctuary prior to occupancy. Proportionally, this is not many hours during a heating season. 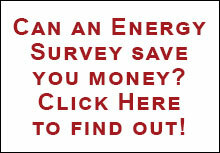 Do they save heating energy? In 1984, ICE began using a non-contact, infrared thermometer to determine if the surface temperatures between the sanctuary ceiling and the floor were different. We discovered many times that the floor was warmer than the ceiling, usually because the heating plant was located in the basement. But the temperature of the surfaces is not necessarily the temperature of the air. Rarely was there temperature difference greater than a few degrees, even with ceiling heights near 100 feet. We decided to test the effectiveness of the fans in a typical sanctuary in Philadelphia during cold weather. The Summit Presbyterian Church has three ceiling fans, at a height of thirty-six feet, installed three years ago for a cost of $750. We used a recording thermometer with one probe at the thirty-six foot height, one probe at the pew level, and a clamp-on transducer to show when the fans operated. We began the test on Friday when the temperature of the sanctuary was 46 degrees. Then we tracked the temperature at each probe through Monday morning. Early Sunday morning, the steam boiler, controlled by a clock thermostat, began to supply heat to the sanctuary. The air near the sanctuary ceiling was heated at the same rate as that at the pew level, and the temperatures remained the same. Prior to the worship service, the fans were turned on for about two hours. There was very little difference in the air temperatures at the ceiling and pew levels. As the sanctuary cooled off after the services, there was very little difference in temperatures. And without warmer air near the ceiling, the fans have no hope of saving energy. There was no stratification of temperatures in the sanctuary, so the ceiling fans will not be able to move warm air downward. No energy will be saved by running the fans. As we were preparing to measure the effectiveness of the fans at the Summit Presbyterian Church, we received a test report on various types of fans used in Navy aircraft hangers. View or Download a copy of the Hanger Destratification Investigation here . Modifying the heating system to use the warm ceiling air for return air. Copies of the report (Hangar Destratification Investigation by J. Ashley, N-1692, April, 1984) are available from the Naval Civil Engineering Laboratory, Port Hueneme, California 93043. Many congregations have told us that, during the summer, the moving air from ceiling fans makes the sanctuary feel cooler. Cooler air is nearer the pew level. The air that is near the ceiling during the summer, however, is likely to be warm. That is the reason for ceiling vents in many sanctuaries, particularly older ones. In any case, ceiling fans don’t save cooling energy, unless they are substitutes for running an air conditioning system. It is not practical to run both ceiling fans and central air conditioning at the same time. Cool air is heavier than warm air and surrounds the congregation. The air above the congregation may be quite warm. Blowing that warm air into the cooler air with ceiling fans will increase the use of electricity for cooling. ICE is always willing to consider data that can demonstrate that using ceiling fans during the heating season makes economic sense. If readers can provide us with actual measured data, and if it is valid, we would like to share the information with our readers. First, measure the temperature of the air high in sanctuary during the winter. It may not be as warm as you think. Second, don’t forget to include scaffolding costs, and cost of electricity to operate the fans in your payback calculations. Third, be careful how you install them. If you blow air directly on occupants who do not like such air movement, you will hear complaints. If you install the fans below the lights, light will flicker on the hymnals. If you don’t install good quality fans, they will click during sermons and prayers.